Halloween sure was a lot of fun this year. 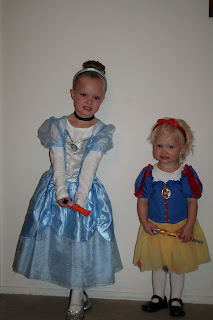 Our two little princesses had a great time. Ashlee, our beautiful Cinderella, had a whole week of dressing up between preschool parties, gymnastic parties, and family parties. Halloween day we went to Ephraim to celebrate and trick-or-treat with family. The weekend before Halloween Ashlee and Taylor got to go stay at their Aunt Melissa and Uncle Kelly's house. They had way too much fun and got spoiled rotten! Friday Melissa and Kelly took the girls to Cornbelly's. Saturday Melissa and Kelly hosted a huge Halloween party for their neices and nephews and some neighborhood children. I definitely missed them while they were gone, but I think the girls were so busy and had so much fun that they didn't have time to miss me! Ashlee looks like mini me Cinderella...Taylor looks so adorable, I love her sweet blonde hair. Looks like fun. Man you did get snow!! I need the leaves to fall off the tree so I can get them raked before the snow flies again here! How cute! Little princesses! :0) We dyed ceanna's hair purple one time and then she liked it so much we had to do red! Already into hair dying!!!! That's awesome that you even attempted to color Taylors hair. 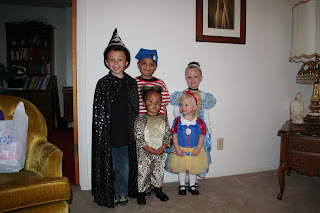 This could have been my favorite halloween ever. I love watching our kids get so excited. Good times. Cute costumes... I love Taylor's black hair!! We finally found a place and are living in Springville. You guy's are going to have to come visit one of these days.